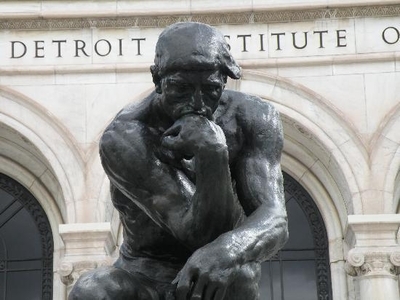 Since last spring, when Detroit's emergency manager, Kevyn Orr, said that he might have to sell art from the city-owned collection of the Detroit Institute of Arts to help pay off the city's $18 billion in debt, the museum has been operating in a state of unreality. Less than a year after voters in three nearby counties approved a property tax to fund the DIA for 10 years, the museum's survival was again endangered. And last week, on the day that Judge Steven W. Rhodes of U.S. Bankruptcy Court approved the city's Chapter 9 filing and allowed Mr. Orr to proceed with his restructuring plan, creditors balked at the less-than-a-billion-dollar estimate of the value of the art provided by Christie's, even though that figure exceeds Mr. Orr's goal of getting $500 million from the DIA. The DIA's predicament is unprecedented. No American museum has ever been pressed to bail out its bankrupt hometown. Any sale would violate two cardinal principles of museum ethics: the doctrine that museums hold art in trust for future generations and that, therefore, artworks may be sold only to purchase more art. Nor has any museum been at the center of the clash between competing definitions of the public good, forced to defend itself from critics who sketch the to-sell-or-not-to-sell quandary in moral terms. These people argue that art cannot be spared while retired police officers and bus drivers are forced to lose part of their pensions—even though the proceeds from art sales would be shared with lawyers, consultants and other creditors and amount to pennies per person. Little wonder, then, that this complex situation has elicited numerous opinions that are so disconnected from reality that they amount to magical thinking. Last month, for example, at a panel discussion in New York on the DIA's plight hosted by the International Foundation for Art Research, Richard Feigen, a well-known New York art dealer, suggested that no one would be so unprincipled as to buy art from the museum. The audience applauded, until David Nash, another well-known New York dealer, broke the spell. Plenty of people in Russia, the Middle East and China would be interested in buying the DIA's masterpieces, he rightly said. At the same event, the DIA's director, Graham W.J. Beal, said he was "optimistic" that the museum would escape unscathed, citing the 22-page opinion issued by Michigan Attorney General Bill Schuette in June. It declared that "no piece in the collection may be sold, conveyed or transferred to satisfy City debts or obligations" because the art is held in public trust. Yet Mr. Schuette's opinion is far from impregnable: It may not withstand the near-certain court challenge from creditors. For their part, Detroit's creditors—perhaps eyeing last month's sale of Francis Bacon's 1969 triptych of Lucien Freud for $142.4 million—are unrealistically expecting billions of dollars from the DIA. Yet the DIA owns no contemporary artworks of similar caliber; its most important objects are Impressionist and Old Master works, such as Rembrandt's "Visitation" (1640), markets where demand is lower, buyers fewer and prices generally not as high. The DIA's art must be treated like all other city assets. This notion presupposes similar outcomes in each case. But the DIA is the only one of the three main assets in Mr. Orr's sights that would be irrevocably damaged. One other, Belle Isle, which houses the aquarium and yacht club, has been leased by the state and taken off the table. The second, the Detroit Water and Sewerage Department, might be privatized, then even improved. If art from the DIA is dispersed, the museum would be destroyed—if not immediately, when the museum loses the $23 million provided by the millage tax (two of the three counties have said they will cease payments if the museum's art is sold and an official of the third has said the same privately), then eventually, as it becomes less attractive to visitors and donors alike. The DIA could easily part with some of its 66,000 artworks. Mr. Orr charged Christie's with evaluating only the 2,871 works purchased with city funds, to avoid violation of donor restrictions. Of those, fewer than 450 have a fair market value of $50,000 or more, and 319 of these works are on view. Some 75% of the total value lies in just 11 works, including Pieter Bruegel the Elder's "Wedding Dance" (c. 1566), Vincent van Gogh's "Self-Portrait" (1887), Henri Matisse's "Window" (1916), Giovanni Bellini's "Madonna and Child" (1509) and a drawing by Michelangelo. Other U.S. museums will buy the DIA's art, keeping it on public view. Nothing could be further from the truth. American museums, by and large, do not have the acquisition funds they would need for, say, the Bruegel. Even if they did, they wouldn't buy because of ethical reasons. Walter A. Liedtke, curator of European paintings at the Metropolitan Museum of Art, recently said that his curatorial staff would quit if the Met bid on anything from the DIA, a prospect also probable at other museums. Foreign museums will buy these masterpieces, keeping them in the public domain. This is unlikely. With the exception of some in the Middle East, most museums are stretched for funds, too, as state funding has shrunk. Rather, the DIA's art would probably go to private collectors overseas and out of public view. Case in point: van Gogh's "Portrait of Dr. Gachet," which sold in 1990 for a then-record $82.5 million to a Japanese businessman, hasn't been exhibited publicly since. Philanthropists will come to the DIA's rescue. In this scenario, wealthy Michiganders would buy the DIA's treasures and redonate them. But in the past several years, the DIA raised more than $350 million from this donor pool to modernize its building and increase its endowment. The millage was designed to give the DIA time to raise an added $300 million over 10 years for its endowment. Would these same individuals and foundations be able to donate an additional, say, $500 million to repurchase what the museum already owns to pay Detroit's bills? Doubtful. The art doesn't have to be sold; it can be monetized. Yes, money can be gleaned from the collection without selling it. But museum ethics block the easiest method of doing so, using it as loan collateral, and ethical standards can't simply be abandoned at the door of bankruptcy court. More important, where would Detroit get the money to repay the loans? This proposal imperils the DIA's collection in a deal over which it has no control of the outcome—and that's a bad deal. Christie's has advanced some other ideas for monetizing the collection, but each has limited potential. In one, the DIA would tour part of its collection, as the Barnes Foundation did in 1993-95, earning about $17 million. But the two collections are not comparable; a better guide would be "Rembrandt, Van Dyck, Gainsborough: the Treasures of Kenwood House, London," which recently visited four U.S. museums and took in a reported $375,000. The DIA has twice toured portions of its collection recently, raising $700,000. Another idea would have the DIA find a cash-rich partner museum, an idea fueled by the Louvre's pact with Abu Dhabi for $1.3 billion over several years. Mr. Beal has traveled to the Middle East, but found no takers. More reasonable partner expectations might be seen at the Museum of Fine Arts, Boston; it provides two exhibitions per year to Nagoya, Japan, for about $2 million a year, less expenses, a meager amount. A third idea would create a "masterpiece trust" into which the DIA would transfer ownership of city-owned works. Other museums, here or abroad, would then pay membership fees to the city entitling them to borrow works from the trust, like a time-share. But this would remove DIA's treasures from the view of the Michigan public whose tax dollars support the museum. How, then, can the DIA realistically meet Mr. Orr's decree that it be "part of the solution"? The Detroit Free Press reported last week that the city's power brokers are "working furiously" to raise $500 million from foundations to barter for the DIA's independence. Though difficult—the total annual giving of 10 of the largest foundations involved barely tops $1 billion and it would be hard for them to divert so much to the DIA and meet their other obligations—this would reconcile the seemingly irreconcilable, assuming it passed muster with Mr. Orr. If that fails, there appears to be only one life-saving solution for the DIA: The state would pay Detroit and transfer ownership to Michigan. So far, Gov. Rick Snyder has declined to give the idea a hearing, and the diversion of money from state coffers to the DIA might face opposition. But Michiganders might remember that in the 1920s and '30s, the cash-hungry Soviet government sold off Russia's art treasures, dispersing them to other countries. Today, that episode is viewed as a national tragedy.